Jeremiah Wadsworth was Commissary General of the Continental Army. Wadsworth also spend time in the United States House of Representatives as well as being one of the richest men in Connecticut. Yesterday I published an article about William Wadsworth’s adventures on the New York frontier. Since the Wadsworth family had several Founders, I thought today we should discuss the life of the man who actually owned that land…his uncle Jeremiah Wadsworth. Jeremiah Wadsworth took to the sea as a young man. He sailed on one of his family owned ships, quickly becoming a Captain. By the outbreak of the American Revolution, Jeremiah had made enough money for himself to return to his home in Connecticut. While it is easy to look back at the Revolutionary War as being fought and won by the Continental Army, the truth is the State Militias acted independently of (though in conjunction with) the united forces. Therefore, technically, the war was fought by fourteen separate armies (fifteen if you count the French (sixteen if you count the Spanish)). As such, each individual army needed to be fed, clothed and armed by the different governments to whom they reported. It was in this situation that Jeremiah Wadsworth was asked to use his wealth and connections to supply the Connecticut Militia. George Washington noticed how well-supplied the Connecticut soldiers were and demanded (in his polite way) that Wadsworth be assigned the position of Deputy Commissary of Provisions for the Continental Army. After the resignation of Joseph Trumbull, Jeremiah was promoted to Commissary General which placed him in charge of feeding and clothing the Continentals. In this position, Wadsworth worked closely with Quartermaster General Nathaniel Greene who was responsible for housing the army as well as distributing the provisions. When the French Army arrived, Jeremiah had the additional task of providing for their soldiers. Jeremiah Wadsworth made a hefty profit which, although it seems shady now, was not uncommon at the time. In fact, it was expected. He used this money, plus he previous fortune, to make several investments which led to his status as one of the wealthiest men in Connecticut. After attending his State’s Constitutional Ratification Convention, Wadsworth was elected to the final session of the Confederation Congress. Here he assisted in the transition from the Articles of Confederation to the new National Government. This was followed by immediately receiving election as an inaugural member of the United States House of Representatives. He sat in Congress for six years. One of Wadsworth’s investments was in a humongous tract of land that spanned the entirety of Western New York. Jeremiah had sent his nephews out to settle the land but there were several conflicts with the Native Americans. After Isaac Smith turned down the opportunity, Wadsworth was asked by President Washington to act as the United States Representative to a meeting which ended with the Treaty of Big Tree. This would be Jeremiah’s only time visiting the land he owned. Before retirement, Jeremiah Wadsworth spent five six years on the Connecticut Executive Council which we would know today as the State Senate. Hi. Are you still reading? I write a little bit at the bottom here after every article. 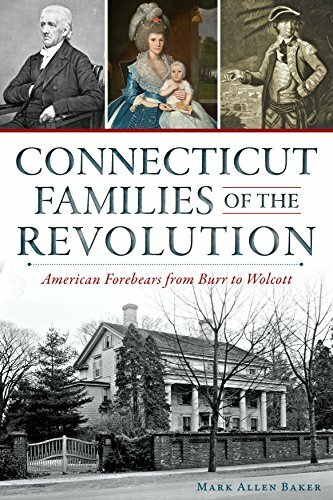 Usually, I start with some other Founders I’ve written about, followed by a book recommendation (today’s book is ‘Connecticut Families of the Revolution’, affiliate link below). Then I recommend you subscribe to my email list. Do you enjoy these recommendations? Is there something else you’d like to know? I’d love to hear thing you like/hate on this website so I can make it better for you. Feel free to contact me via email, Facebook or Twitter and let me know your thoughts.